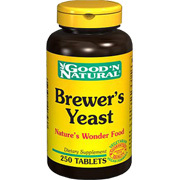 Brewer's Yeast is a nutritional suplement that is used as a source of B vitamins and chromium. It is also used for loss of appetite, acne, atherosclerosis (fat deposits in arteries), and diabetes. For adults, take two (2) tablets three times daily, preferably with a meal. As a reminder, discuss the supplements and medications you take with your health care providers. WARNING If you are pregnant, nursing or taking any medications, consult your doctor before use. 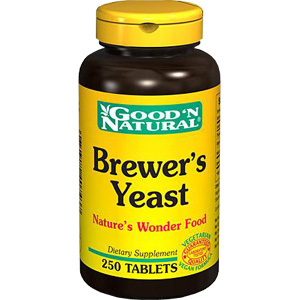 Avoid this product if you are allergic to yeast. Discontinue use and consult your doctor if any adverse reactions occur. Other Ingredients: Silica, Cellulose(Plant Origin), Vegetable stearic acid, Vegetable Magnesium Stearate. Free of: milk or milk derivatives, lactose, sugar, preservatives, soy, artificial color, artificial flavor, sodium(less than 5mg per serving). Brewer's Yeast 7 1/2 Grain is shipped in a discrete, unmarked package. Orders are processed immediately and usually take about 3 to 5 working days to be received. We do ask that you try it for 2 to 3 weeks to feel the full effects. Any information received is used only for order processing and shipping purposes. Your information, such as e-mail address, will never be disclosed to a third party.